The FIRST TWO BOOKS in the hilarious and iconic Adrian Mole series from comic legend Sue Townsend. Telling us candidly about his parents' marital troubles, The Dog, his life as a tortured poet and 'misunderstood intellectual', his love for the divine Pandora and his horror at learning of his mother's pregnancy, Adrian's painfully honest diary is a hilarious and heartfelt chronicle of misspent adolescence. 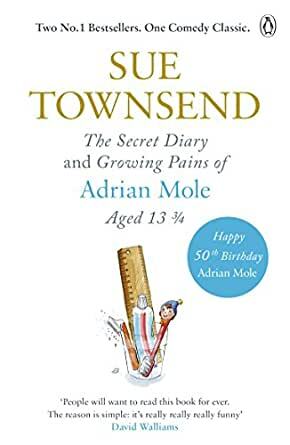 Features the complete texts of The Secret Diary of Adrian Mole Aged 13 ¾ and The Growing Pains of Adrian Mole. Double edition celebrating Adrian Mole's 50th Birthday.